"This is a different and healthy pasta salad. Use whole-grain or low-carb pasta if you like and substitute veggies to suit your taste. Wear plastic gloves while chopping hot pepper and be sure you don't touch your eyes or nose." Bring a large pot of lightly salted water to a boil; cook the pasta spirals at a boil until tender yet firm to the bite, about 8 minutes; drain. Rinse pasta with cold water until cool; drain. 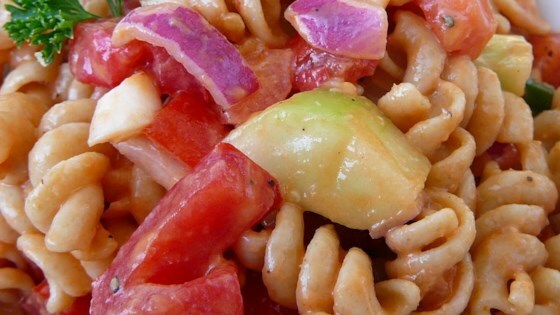 Toss drained pasta, sweet onion, green bell pepper, chile pepper, tomatoes, and cucumber together in a large bowl. Whisk olive oil, tomato sauce, lime juice, red wine vinegar, garlic powder, salt, and black pepper together in a separate bowl; drizzle over the pasta mixture and stir to coat. Chill in refrigerator 2 hours; stir to serve. Very good. I liked the addition of tomato sauce to the dressing. Definately a repeat. Great way to use cucumbers, tomatoes and peppers from the garden. I used a yellow bell pepper and tri-color rotini for even more color. Excellent pasta salad. Could use a bit more sauce for me.